First published in 1970, Bury My Heart at Wounded Knee generated shockwaves with its frank and heartbreaking depiction of the systematic annihilation of American Indian tribes across the western frontier. In this nonfiction account, Dee Brown focuses on the betrayals, battles, and massacres suffered by American Indians between 1860 and 1890. He tells of the many tribes and their renowned chiefs—from Geronimo to Red Cloud, Sitting Bull to Crazy Horse—who struggled to combat the destruction of their people and culture. 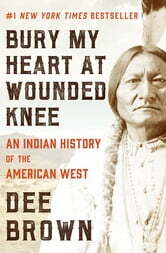 Forcefully written and meticulously researched, Bury My Heart at Wounded Knee inspired a generation to take a second look at how the West was won. This ebook features an illustrated biography of Dee Brown including rare photos from the author’s personal collection. I read this book over 40 years ago & it still haunts me. Enlightning, educational - this was a read that I have never forgotten. Highly recommend.